This only leaves 2 possibilities: Delinot or PD. The first appears on the toy tag, while the latter appears on the horn itself. I have searched all over the Internet for references to a French toy manufacturer with either of these 2 names, but have come up empty-handed. I have therefore opted to go with the name Delinot. If you know differently, please let me know. Thanks! 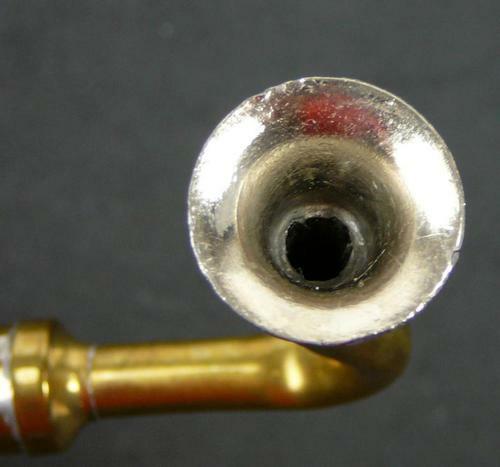 It should be noted that the seller of one of the 8 valve horns on eBay noted that it had reeds like a harmonica. If this is indeed the case, then these would be free reed instruments/toys. Interesting, and more sophisticated than I originally thought. 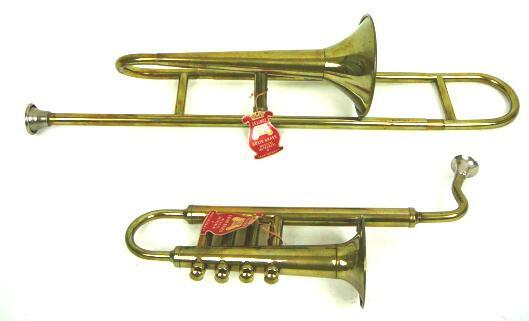 This minty, solid brass, pair of children’s toys came up on eBay in September 2010. Like the Camp Saxo France, this Delinot saxophone comes from France, and bears a striking resemblance to the Jazzophone-style instruments. The saxophone is 10 ½” long. In the fall of 2011 another one of these minty toys appeared on eBay. Perhaps the only thing more stunning than the condition it was in, was the price it fetched at auction. 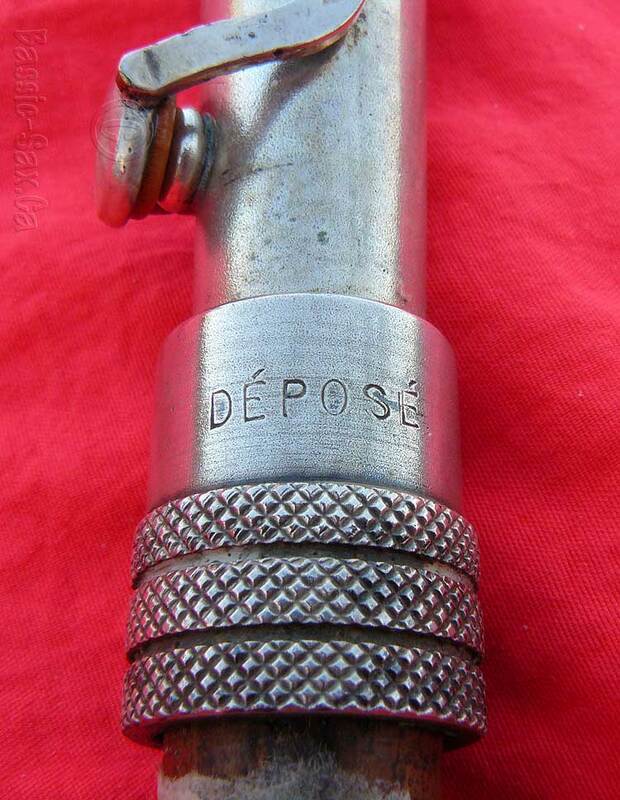 After 11 bids, this little French toy sold for $114.05. 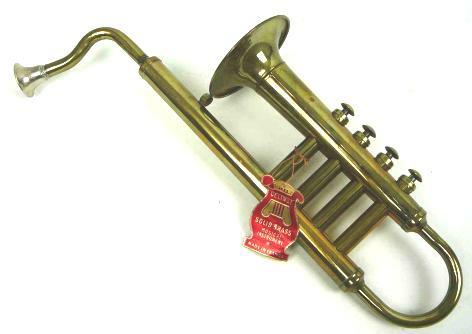 That works out to about $11.40 per inch, for a vintage, French, brass toy made to resemble a Jazzophone. 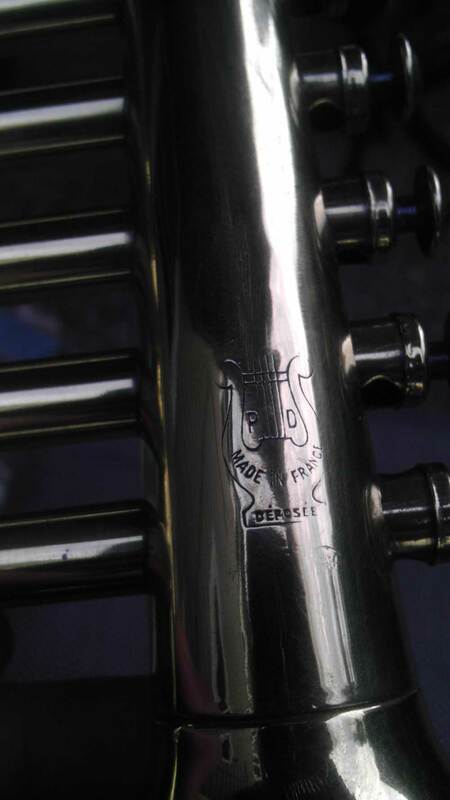 After writing about the 4 valve Delinot saxophone shown above, I got an email from a fellow who had one of the 8 valve variety. 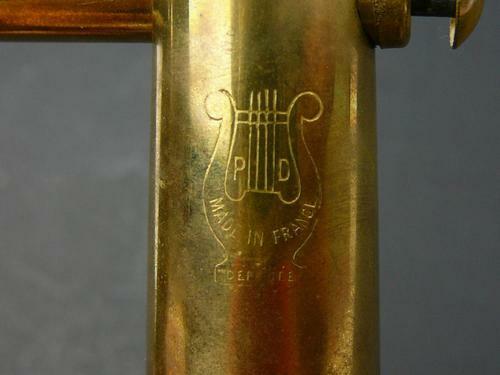 Like the 4 valve model, this has the same lyre logo. 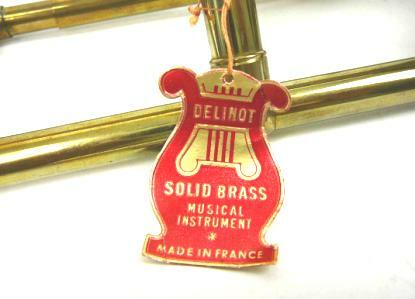 Very shortly after I received the above photos, the following 8 valved Delinot sax showed up on eBay. 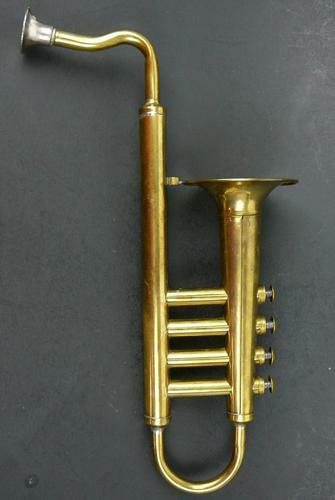 Here’s an interesting vintage toy saxophone. 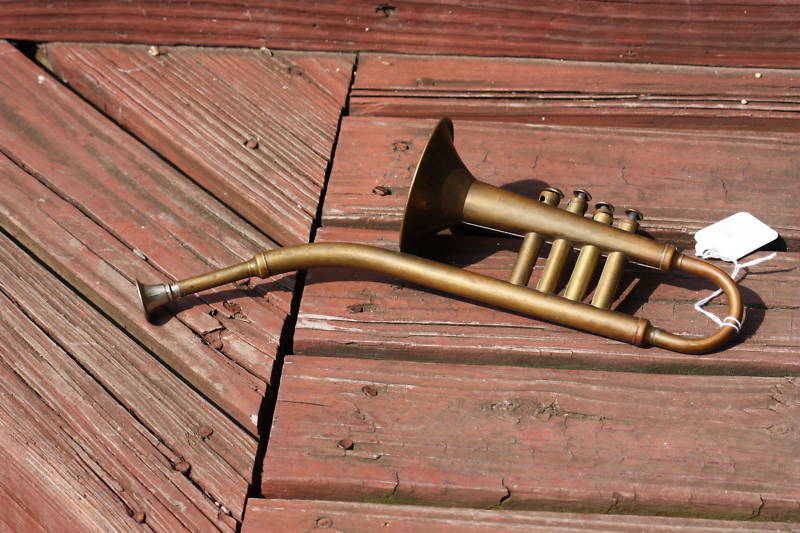 It’s all brass construction and the brass has a dark patina. It’s about 15 1/2 inches long and the bell is 3 1/4 inches in diameter. It plays a major scale, 1 whole octave with reeds that are like harmonica reeds. Pushing one of the buttons sends the air through that reed and sounds the note. You can play one note or as many of the notes as you like at the same time. 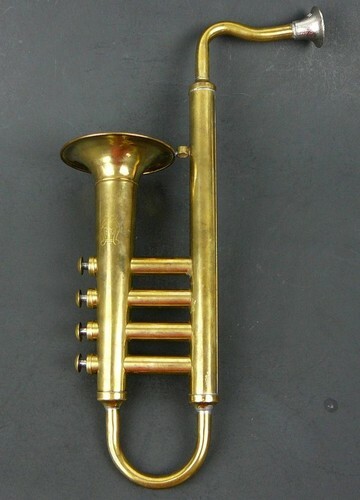 It is missing the mouthpiece. 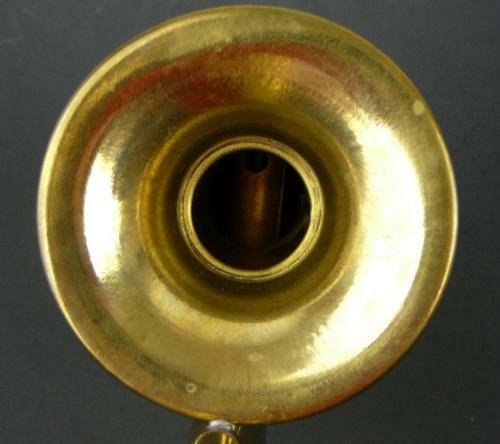 Both the 4 and 8 valve toy Delinot saxophones were likely inspired by true sax-shaped trumpets made by (mostly) German horn manufacturers early in the 20th century. 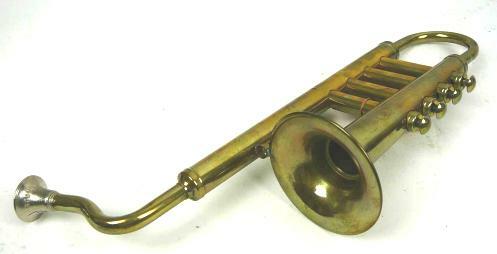 Some of these trumpets had double bells with built-in mutes; others had rotary valves; still others came in a variety of sizes. 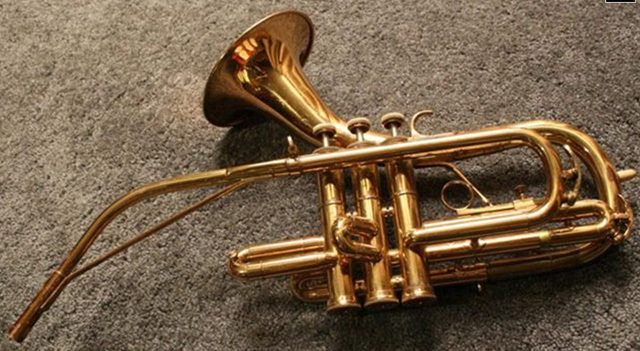 If you’d like to read more about the real Jazzophones, check out the website dedicated especially to saxophone-shaped trumpets.